There are reports today that one of the works stolen from the Emil Buehrle Collection in Zurich has been recovered in Serbia. ARCA’s blog has a good rundown of the current press reports. The work was stolen in 2008 along with 3 others. 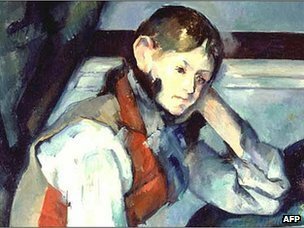 Authorities have not named the painting, but local media have reported it is The Boy in the Red Vest, which was taken from Zurich’s Emil Buehrle Collection. Police said three people had been arrested in connection with the theft. It added an art expert was being flown in to confirm the authenticity of the 1888 painting, worth $109m (£68.3m).